If you're brand-new to the Reverb community, you might be wondering where you should get started. We're here to help. Below, we've detailed the steps you should take to sign up for a Reverb account and set up your own shop so that you can start selling your gear. First thing's first: Sign up for your own Reverb account. To do this, click the "sign up" button in the top right corner of any page on the Reverb site. Fill out the form with your information to sign up manually, or click the "Sign Up with Facebook" link at the bottom to sign up with your Facebook account. Be sure to create a secure password. 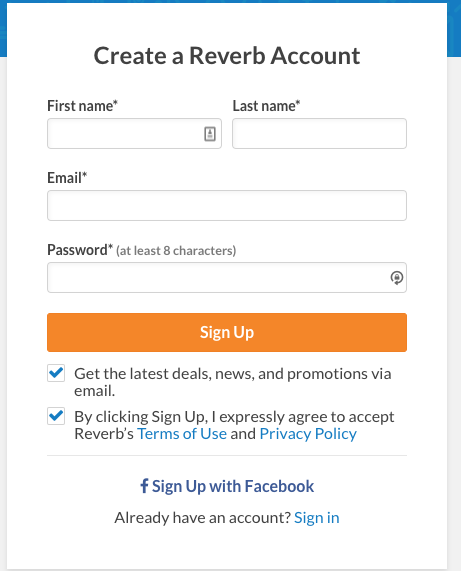 The last step in setting up your Reverb account is confirming your email address. After you finish signing up, check your email for our confirmation. Clicking the orange button will confirm your email and redirect you to the Reverb homepage, where you can go then begin to set up your Reverb shop. To get started, hover your mouse over your grey account avatar icon highlighted above, which will bring out the drop-down menu. 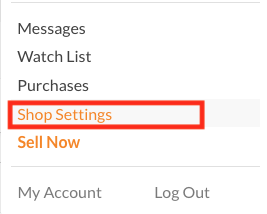 Click on "Shop Settings." Below, we'll run through the things you'll need to do to get your shop going. The first steps in launching your Reverb shop are to come up with a name, write your shop description, and choose your banner photo. Your shop name is the first point of connection you'll have with potential buyers, so try to be creative and memorable. For your banner, choose a photo that represents your shop in some way and make sure that it's sized at 960x160 pixels for the best results. When it comes to drafting your shop's description, the same rules apply, but you have a lot more space to make an impression. Show off your personality, tell buyers about your business, and have some fun with your description. Remember to adhere to Reverb's guidelines and policies—no URLs, emails, phone numbers, or addresses are allowed in shop descriptions. You can also add some additional content to your shop description as well, like a link to your website or Facebook business page to be included at the bottom of your shop description, or a YouTube video embedded alongside it. There are a few other shop policies that you'll want to set before you post your first item—your shop location and how you'll receive money. The shop location will be used for pickup orders—so be accurate. Next, choose how you receive money from your Reverb shop sales. Enabling Reverb Payments comes with a few benefits, like a lower processing fee and the ability to give your buyers the option of paying however they'd like. Enabling this option also gives you the opportunity to become a Preferred Seller, which carries its own list of perks. Reverb Bucks are our on-platform currency. Paying out to Reverb Bucks happens immediately, allowing sellers to use the money from their sales right away on Reverb. As a bonus, buying gear using Reverb Bucks also comes with a 1% discount. Bank Account: Money can also be paid directly to your bank account. After your first sale, the funds will be released when the buyer receives the gear. For any sale after that, you'll see a payout for the next business day, when tracking is entered into any order. Allow between one and three business days for your money to hit your bank account. If you opt against using Reverb Payments in favor of PayPal, you can also choose to get your money paid out directly to your bank account. But be advised that there are a few downfalls to PayPal-only shop policies. For instance, buyers are then only able to pay using PayPal. There's also a higher payment processing fee and no Reverb Protection. You have the option to translate your listing descriptions into different languages if you're listing gear internationally, though it's not required in order to do so. Lastly, you must set your return policy. We have a Reverb Recommended return policy that you can check out, pictured below, but you do have the option to select a custom policy if you'd like to fine-tune something that works better for you. Have any questions about how to make the most of your Reverb account? Let us know in the comments below.